Air-Art Heating and Air Conditioning has been dedicated to offering the people of the North State quality workmanship and friendly hometown service. Being a local Chico family that plans to stay here and grow with the area, Air-Art wants to prove to the North State its long-term commitment to the HVAC industry. 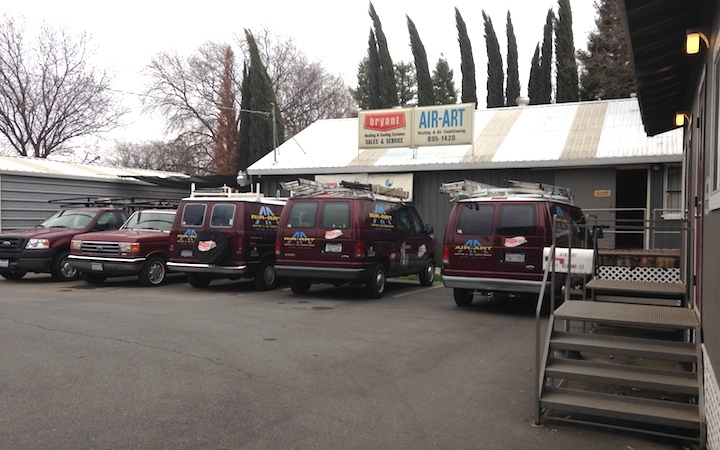 Air-Art started out in 1977 installing systems for friends and acquaintances and has grown into a major HVAC company, having done projects as far north as Klamath Falls, Oregon as far west as Sea Ranch on the coast, as far east as Lake Tahoe and as far south as Concord. We are now specializing in residential zoning, energy management, indoor air quality and total home comfort. Supplying a full range of options to property owners in today’s vast market. With products and support from the Bryant Company, enhanced sales techniques, marketing and management skills from training classes by some of the industries top professionals. Air-Art is dedicated to improvement. In 1977 Air-Care of Chico was formed. Started by Charles A. Pugh Sr. and his wife Beverly J. Pugh and their three sons, Chuck Jr., Nick and Victor. Working from a shop at their home located in Chico, CA. with one truck and some used sheet metal equipment; they started doing work for many family and friends. In 18 months they were able to purchase a piece of property with a building and move to their present location. In the past 35 years the company has been able to grow to 4 trucks, 2 service vans and a fully equipped fabrication shop. In 2003, Air-Art received the Silver “Metal of Excellence” from the Bryant Company. In Jan, 2013, Chuck Pugh Jr, bought the company from his father and continues the Air-Art legacy of family owned business. His son Bryan Pugh now works in the installation department. The original owner Chuck Pugh Sr. has worked in the industry doing commercial and residential work for the last 50 years. His wife, Beverly Pugh was the bookkeeping and office manager for 35 years. His oldest son, Chuck Pugh Jr. has been with the company since its inception, working in the residential field for 20 years and the service/sales field for 14 years. His youngest son, Victor Pugh has been working in and managing the residential installation department for 30 years until his departure in 2012. Chuck Pugh Sr. had been in the sheet metal union for 18 years prior, learning the trade and developing outstanding sweetmeat skills. Most of his knowledge coming from working on large commercial projects like, schools, banks and the new Susanville prison facility. All three sons had worked for their uncle’s non-union shop, learning the residential side of heating and air conditioning.